Ketchum, Idaho (USA) -- In Western cultures, sacred art is cherished, declared invaluable and preserved by any means possible. Meanwhile, sacred Buddhist mandalas, complex symbolic representational paintings of the universe, are often destroyed nearly as soon as they are completed. << Tibetan Buddhist mandalas, such as this 19th century homage to the Eleven-faced Avalokiteshvara, are often made of sand before being ceremoniously destroyed. Photo by Joachim Baader [detail]. (c) Wisdom Publications 2006. Reprinted from The Tibetan Art Calendar 2006, with permission of Wisdom Publications; www.wisdompubs.org. 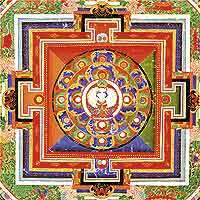 The painstaking creation of a sand mandala is a meditational practice, an act of mindfulness. Its consequent destruction represents the inherent impermanence of life, a fundamental principle of the Dharma, or teachings of the Buddha. In the East, art and religion have enjoyed a peaceful harmony for thousands of years. Free from the limitations of strict Biblical interpretation, Buddhism has a rich history of visually depicting, and indeed practicing, spiritual belief. In the West, the relationship between art and religion has not always been so calm. After all, the Bible openly warns against depicting anything holy. "You shall not make for yourself any graven image, or any likeness of anything that is in heaven above," says the Second Commandment. In the West, society's adherence to this edict has waxed and waned. Medieval Europe's Dark Ages were so called due to their lack of cultural record. This deficiency of the "light of knowledge" was largely a product of strict religiosity: Since man was created in God's image, even art depicting people was forbidden. However, within a few hundred years, the Renaissance would brilliantly shed those artistic shackles. Church and state alike supported spiritual art of the highest magnitude. Rather than an abomination in the eyes of God, the depiction of God in Michelangelo's Sistine Chapel (completed between 1508 and 1512) remains one of the greatest works of religious art. Eastern cultures and their religions were never quite so internally conflicted. With no singular God to worship, Buddhists and Hindus were free to depict their spirituality in far more diverse ways. "In Buddhism, you have no god. Buddha is not a god. He is a person and he is a teacher," said Dean Sluyter, a meditational teacher and author of Buddhism-related books. "(Buddha) was a human being who attained enlightenment and taught other humans how they might be able to attain enlightenment." Sluyter explains, however, that due to the religion's early reaction against Hinduism's abundant idolatry, idols of the Buddha were originally discouraged. Additionally, the Buddha's teachings stressed internal worship, rather than external, ecclesiastical rituals. Today, though, Buddha statues are ubiquitous. The trend, Sluyter says, began with people's natural wish for a tangible place to practice, combined with a bit of cleverness. "People wanted a focus of their devotion, a place to lay their flowers and burn their incense. So they had representations of the Buddha's footprint." Indeed, some of the earliest examples of Buddhist art show these negative reliefs, acting as ghostly records of the Buddha's time on earth. As Buddhism migrated to new lands, diverse religious art spread with it. Tibetan Buddhist art, in particular, stressed devotional awareness, Sluyter said. "Every detail has spiritual significance: the number of jewels on a deity's crown, or the position of the legs of a seated Buddha—they all represent very specific aspects of the unfoldment of awareness into enlightenment." In his recently released book, "Cinema Nirvana: Enlightenment Lessons from the Movies," Sluyter applies the same principle as he locates spiritual truths in James Bond's weapons and the Seven Dwarf's eyes. Like film, Buddhist art acts as more than a mere depiction of life or scripture. Rather, it plays an active role in meditational practice. Mandalas are a prime example. In late May, monks visiting the Wood River Valley from the Drepung Loseling Monastery will create a sand mandala. It is one in a series of events that begins this Monday, April 3, with a lecture (see related story) by Orville Schell, dean of the School of Journalism at the University of California at Berkley. Throughout April and May, Buddhist-themed art will be on display at the Sun Valley Center for the Arts in Ketchum. Along with photographs and sculptural installations by contemporary Western artists Linda Connor, Kirsten Bahrs Janssen and Arlene Shechet, the Center has acquired a small collection of Asian art and artifacts on loan from the Davies-Reid Gallery, the Pacific Asia Museum and the collection of the late Nancy King, a part-time Sun Valley resident who collected Tibetan art during extensive travel. Since her death, the collection has been donated to the Pacific Asia Museum. The "Art of Tibet" will be on display through late May in Ketchum. This Friday marks the opening of "Art in Tibet," a two-month-long multidisciplinary project conducted by the Sun Valley Center for the Arts. The program will display, study and create art influenced by the remote Himalayan nation, now occupied by China but still the spiritual home to the Dalai Lama and millions of Tibetan Buddhists around the world.